Louis Roederer Cristal сhampagne has a rich and full-bodied taste with hints of white lily, candied lemons and oranges, slightly roasted almonds and hazelnuts. The taste of this spirit is filled with juicy fruity notes of mango, melon, peach and grapes, which merge with a delicate aroma of Viennese pastries, to create a rich and excellent drink. Its aftertaste is long and pure. 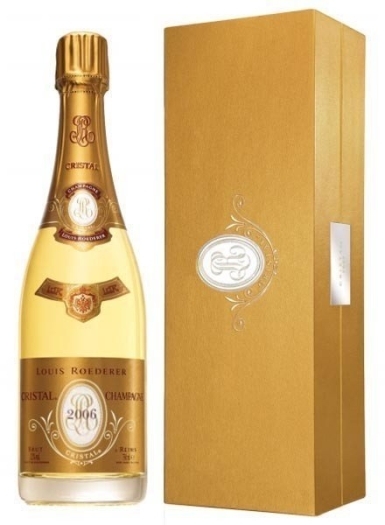 Truly "royal" Louis Roederer Cristal champagne acquired its name from the Russian Emperor Alexander II, who adored this spirit. It was for him, the wine wine was bottled in cristal bottles, le cristal de la bouteille. For the production of this wine are used such grape varieties: Chardonnay and Pinot Noir.